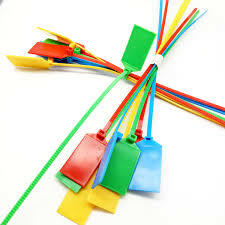 RFID seal tag is made of pp material , and has many available colors:blue,yellow,green ,red,white. Can be customized with hf or uhf chips.The nylon zip tag has many usage:can be used as RFID container seal tag , cable tie tag, plastic cable tag, stainless steel cable wire luggage tag loop, pallet management RFID tag, wine tracking tag, wine bottle management RFID tag, container seal RFID tag, logistic management tracking UHF RFID tag. The nylon seal tag is compliant with EPC C1G2 (ISO18000-6C) standard, operating frequency is 860~960MHz, which has below features:Easy to fasten ;Durable, Highly visible, waterproof, Anti-corrosion;One-time use ;Faster data collection ;Various customization:color,dimension,printing logo/numbers. If you want to get free samples, please contact: Email: sales@mhgyjs.com.